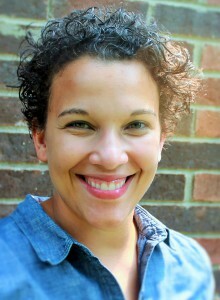 Katrina Boone is in her seventh year as a high school English teacher, her second at Shelby County (KY) High School, where she is also in her second year as a teacher leader as an America Achieves Fellow. CTL asked Ms. Boone to talk about her role as a hybrid teacher who teaches two classes each morning, then spends her afternoons working on teacher leadership initiatives for the Kentucky Department of Education. CTL: How did you come to be a hybrid teacher? Katrina Boone: What led me to (apply for an America Achieves Fellowship for Teachers and Principals) was that the work-life balance (with an infant son) was kind of unbearable, and I just felt lonely. I Googled, “Why should I not quit teaching?” and I came across this woman’s blog post, and I saw a lot of myself in what she was writing about. She said the reason she didn’t quit teaching was the America Achieves Fellowship. I researched it, I applied and got it – and I did not quit teaching. I had really good colleagues, but I felt lonely in my ambition to step outside the classroom and impact the larger group of students, and to increase teacher voice and influence. CTL: What was it about teaching itself that had caused you to want to take a role outside as well as inside the classroom? KB: From the first year of teaching, I was very frustrated about the narrative of public education that I saw in the media. I was kind of frowned on and patted on the head about being a teacher. I felt teachers didn’t have a lot of voice in the way they were perceived by people outside of education. CTL: How is your time at school divided now with the America Achieves Fellowship? KB: I teach two classes in the morning, then I have a planning period until about 12, then I spend the rest of the afternoon working on teacher leadership initiatives for the (Kentucky) Department of Education. CTL: How has the fellowship changed how you feel about your work in education? KB: The big difference is, even though it’s more work on the calendar, on the clock, there’s very clear impact. I think that’s a problem for teachers. Sometimes we don’t see the impact of our work until years later. Even though it’s more work, it feels more impactful. CTL: Talk about some of the impact you’ve seen. KB: Another (KDE hybrid teacher) and I did a session on hybrid teachers and teacher leadership, and I met a first grade teacher who was really struggling. She’s taught for a while, and she’s at a new school. We sat and talked with her about the problems she was having, trying to change some of the ways things had been done at her new school. She was feeling frustrated and alone. She was feeling like quitting. I think in talking to her, we found some resources that we could provide to her, and we’re going to follow up with her. To see her facial expression change, that realization, “I’m not alone. There are resources, there are people who can help me outside my building to make a difference in my building.” We empowered her. Having that time and resources to give to other teachers is so important and so powerful. And I got to see that, and we don’t always get to see that with kids. CTL: What do you see yourself doing after the fellowship is over? KB: I really would love to stay connected to classroom in some way. I don’t know if that’s as a full-time teacher, because I’m also really passionate about increasing teacher voice and influence outside of the classroom, and I really believe in the impact that will have on student learning outcomes, and also attracting young teachers to the profession. I meet these 15, 16, 17-year-olds who are so brilliant, so motivated and so ambitious, and they are disgusted by the idea of being a teacher, and I really want to change that. A lot of my hybrid work is going be centered around providing training for teachers so they have the skills they need, to use their voices to impact the perception (of the teaching profession) in the media. I think I would continue to do that when the hybrid role is over. I really believe teachers have to talk about what’s going on in their classrooms. CTL: Some schools and districts resist implementing hybrid teaching. What are some of the challenges? KB: The schools and districts that say (hybrid teaching) won’t work are the same schools and districts that have a master schedule that works really well for the adults in the building, and not for the kids. It was not easy for my school to make the (hybrid teaching) schedule work, but they figured it out, because I think they believed that it was the best thing for me, the best thing for the staff as a whole, and the best thing for the kids in our building. I (also) think (with regard to hybrid teaching) the whole idea of compensation has to be re-thought. I am working more than a full-time job now. CTL: What is the impact of your work as a hybrid teacher on students? KB: I have a lot more credibility with students and parents. They think, she’s not just a teacher, she does all these other important things outside of school. I talk to my students very openly about some of the leadership things I’m doing, and they’re interested in replicating that. All the hybrid teachers are creating projects for their students to work on this year, and my students said, we want to create our own project, and so we did. They’re building community partnerships, and they’re trying to raise money for their work. That was really student driven. Changing their mindset of what a classroom can be, because for them, I’ve changed their mindset of what a teacher can be. I think if we can show hybrid roles’ impact on students, then schools might be more interested. It’s not easy, but it’s not impossible either. This entry was posted in Blog and tagged hybrid teachers, Kentucky Teacher Leadership Framework, teacher leaders, teacher leadership. Bookmark the permalink.